GENERAL HOSPITAL. RICHMOND, October 12th. Dear Madam,- I cannot permit the present favorable occasion, which is afforded by friends going to Maryland, to pass, without sending a few lines informing you of your beloved son’s state of health at present. I thought it might be a species of balm to your anxious sorrowing heart, to receive a little word of intelligence, even from an old Sister of Charity, but, from one who has watched near his beside for more than two months. The Captain is very weak, and still suffers much from his wound, which is not as well as we found it some weeks since. The physician thinks that a second amputation will be necessary; but do not be alarmed at this intelligence, for operations of this description have been frequently followed with complete success; I know that your poor heart trembles when you reflect on the sufferings of your dear son; but have courage; let us trust all to the hands of the good God, from whom we have received so many blessings. He can restore your child’s health, if such be according to his Divine will. As to the Captain, he is perfectly resigned to the good pleasure of God, willing to die, if he is called, or, if restored, willing to serve God by a virtuous, Christian life. He edifies all by his great patience, doing all in his power to avoid giving trouble, accepting every little service with such gratitude, that it is a true pleasure to serve him. I am very sure you envy me my post near him, and that you very often feel like flying to the sick bed of your absent one far away in a distant land, now rendered inaccessible. You may sometimes imagine that he is in need of something; but permit me to assure you, dear madam, that your son is surrounded with every care that a mother’s affection could devise, or a mother’s hands bestow. We only desire to be able to make him more comfortable; we have procured for him a nice little private room, which removes him from every annoyance, and promotes that quiet his state so much requires. The letter of Sister Valentine and testimony of Dr. Swalm paint very different pictures of Hugh McQuade’s final weeks. 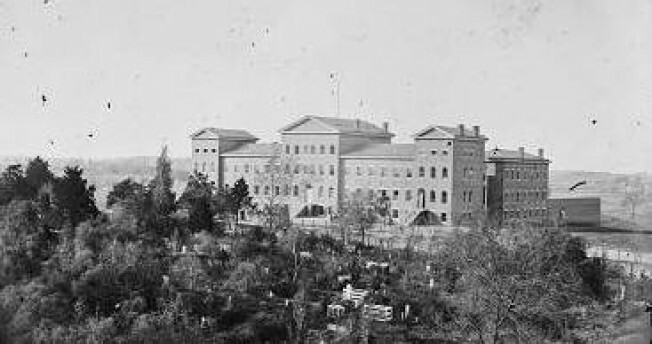 The extent to which the Sisters of Charity displayed favouritism to Confederate prisoners at the General Hospital is unknown, but it is difficult to mask the sincerity in Sister Valentine’s letter. Perhaps the nun was attempting to assuage some of the worry she knew Hugh’s mother would be feeling, and sought to shield her from the reality of the conditions he faced. It would seem that the decision to remove the officer from the General Hospital to the tobacco warehouse was what finally sealed his fate, some five months after first receiving his wound. The effect of Sister Valentine’s letter can only be imagined, but it is to be hoped that the correspondence provided some solace for the 29-year-old’s family during the dark days following his wounding and eventual death. *For more on the military career of Captain Hugh McQuade see posts on the The 48th Pennsylvania Infantry blog here and the Crossed Sabers blog here. A fascinating and sad story. 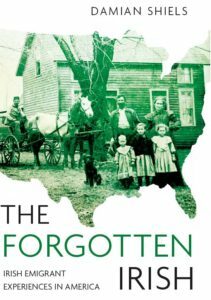 Medicine learned a great deal in the Civil War, but often at the expense of soldiers lives. My great-grandfather was in 1st Bull Run, his unit covering the Union retreat. It’s a wonder that anyone survived the war when you read the battle details. Thanks for this post! Many thanks for your comment! What unit did your great-grandfather serve with? Letters like this really bring home what it was to be grievously wounded during the war, and those who were effected for decades after the conflict by the loss of loved ones. My great-grandfather emigrated from Cavan in 1851 after the famine. He enlisted in the US Army in 1858, before the war broke out – 2nd Infantry, Co. C.; he was stationed at Fort Ripley in what’s now Minnesota, and was one of the first companies to be called up as they were closest to Washington. I am so grateful for your posts – they help me flesh out this part of his life. What a fantastic history to have! The Irishmen who were in the regular army prior to the outbreak of the war often get overlooked, but it was a very popular profession for Irish when they arrived in the US. If you ever want me to look into any aspect of his service I would be more than happy to (do you have access to Fold3 and his pension file number etc.?). I am glad you enjoy the posts!